What exactly is a dad bod? What was once a man’s sculpted and chiseled frame descends into a soft rounded and flabby mass of letting himself go. The term “dad bod” usually refers to fathers and middle-aged men. The term dad bod has found its way from slang to pop culture and even in greeting cards. They translate fun and body positivity towards the recipient. 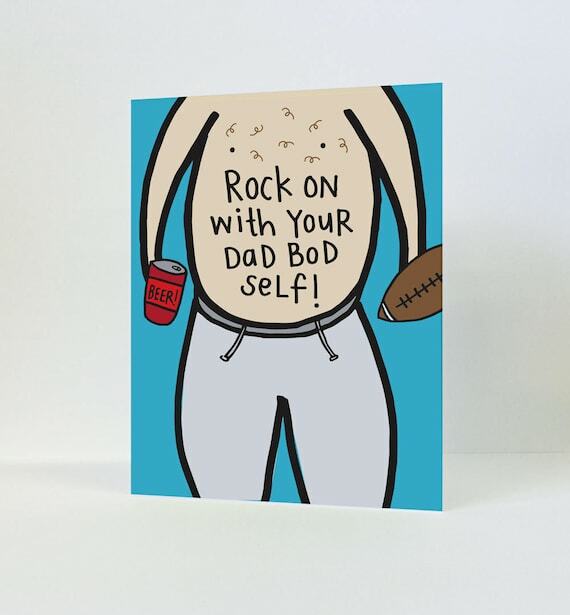 If you want a funny greeting card to give to your dad, take a look at our list of dad bod greeting cards below that will be helpful for your gift giving. To meet your creative preferences, you can also check out our collection of free Father’s Day e-cards. It takes high levels of confidence to be unmoved by naysayers towards having a dad bod. 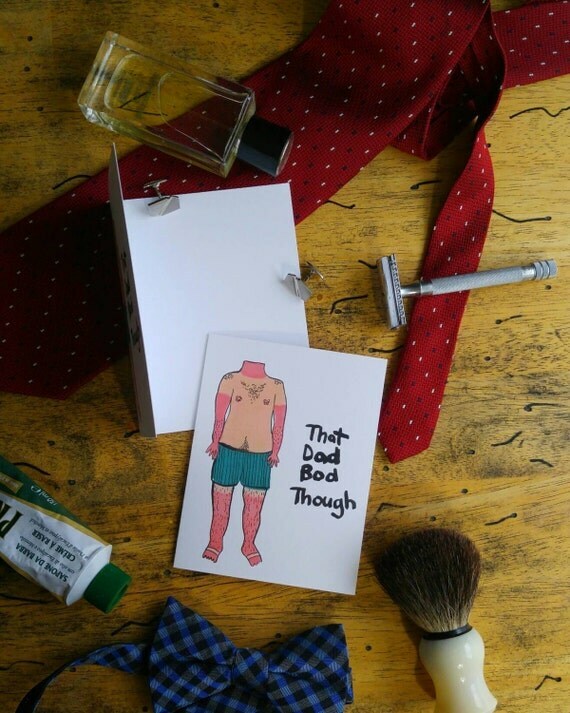 Contradict the pessimism with this body positive dad bod greeting card that is perfect for celebrating Father’s Day. It can also double as a birthday greeting card. This is a cool representation of how relaxed our dads could be. This greeting card does speak that dads are ahead of the times and will never go out of style. This card design leaves the inner section blank to provide more than enough space to write down your message to your heart’s content. Use this greeting card for a dad that’s just as cool as a breeze. This card design showcases the best characteristic of our patriarchs. Their arms crossed by the chest gives off firmness and on the flipside, the round belly reminds us that dads have a softer side. This combination of strength and tenderness is a feat on its own. 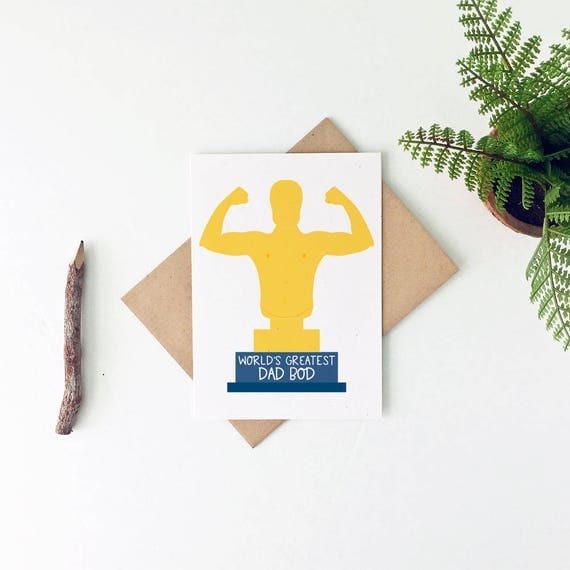 This number 1 dad Father’s Day greeting card is a perfect choice to translate that fun personality that beams from our fathers and their figures. Why not use animals as cute depictions of human fathers with dad bods? The cute and lovable portrayal of animals surely gives us an intense urge to squeeze those critters. All in positive doing that is. This delightful gorilla seems to not have it today but you can’t help but adore the slumped posture, poker face, and the socks-and-slippers combo dads are known for. This has a great design since it incorporates curves, swerves and roundness that makes this gorilla dad too adorable. This cute bear is slaying that lumberjack shirt and truck driver hat. The bear seems to be unbothered in its depiction but the witty use of puns makes it funny. Again, we are reminded that fathers do have a soft side and in this case, a beer bear belly. Also, just like the bear, when you cross them they could harm your life. 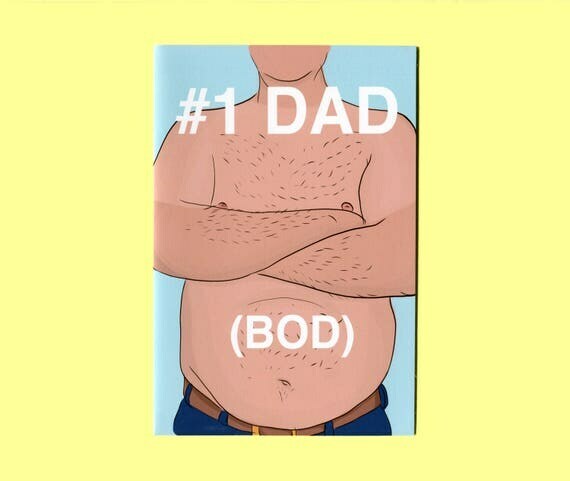 Hand out the award for the World’s Greatest Dad Bod with this Father’s Day greeting card. It is reminiscent of an Oscar or those fancy award shows with golden trophies. The title clearly represents strength. Just because a dad’s belly is soft, it doesn’t mean that dads who have a dad bod aren’t strong enough for their family and self, right? The “that dad bod though” saying has been uttered a lot in the urban setting but it is simply an accepting expression of the fatherly body type. This has a simple use of illustration and message and it means what it means. 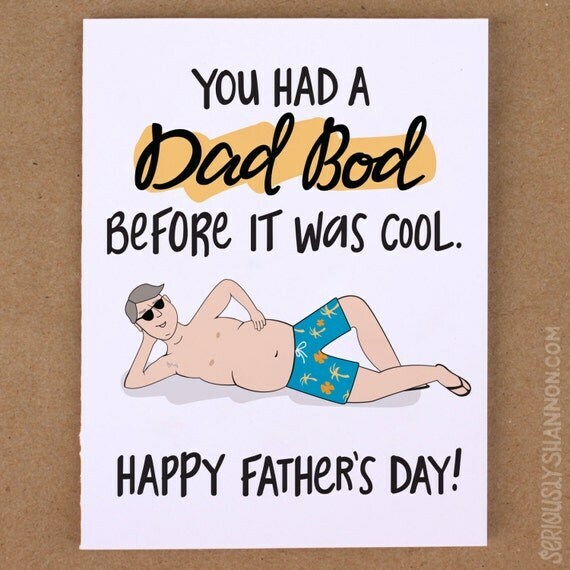 Use this dad bod greeting card not just as an appreciation but as a thoughtful reminder of your respect and love for your patriarch. These dad bod greeting cards not only promote body positivity, but encourage dads to stand out. These also show that we love all our patriarchs no matter their size, shape, or form. Yes, it is amazing to have a six pack and a well-toned physique. But a dad’s strengths is not measured his number of abs, but by the strength of love he has for his family. Greeting cards are an amazing gift idea for celebrating Father’s Day. The essence of letters is that it is heartfelt and fully-realized. With a long duration of preparation, you can add a bit of tweaking and more artistic intuition into your greeting card. Once you have chosen a card design, encase your lovable dad bod greeting card inside an envelope to present it in a neat appearance.